Six adorable patterns in one. 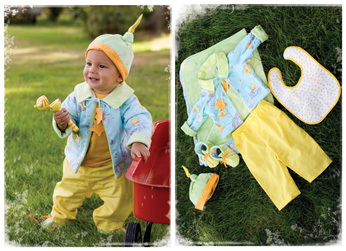 For infants sizes from newborn to 1 yr. (3 sizes: 0-3 mos., 3-6 mos., 6-12 mos.) Included are receiving blanket, hat, shoes, jacket, pants & bib. The jacket is reversible and includes 2 collar options.